Free I.T.’s last day open on Winston Drive was last Friday. Community supporters from as far as Augusta came by to congratulate us (and squeeze in a little shopping and tech support, of course!). Over the weekend, a group of incredibly dedicated volunteers did some heavy lifting and moved all of our stuff into the Homewood space. It was bitter sweet to see the Winston warehouse so empty, but there is no time to waste on nostalgia because Free I.T. Athens has a grand opening to prepare for! 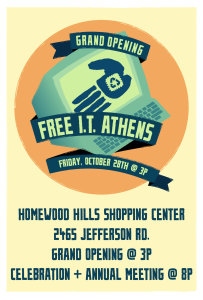 The store, tech support, and donation intake will be open for the first time in the Homewood Shopping Center on Friday, October 28th at 3:00p. After a (finger crossed) a successful first day, we will celebrate at 8:00p. This is Free I.T.’s annual meeting where staff members elect board members for the next term, but it’s also an opportunity to honor all the volunteers who work to bring Free I.T’s vision to fruition. Plus, there will be food! If you’re the social media type, there is a Facebook event for both the grand opening and the annual meeting. As Free I.T. volunteers know, it can be challenging for an all-volunteer organization to communicate with the community effectively. We want to ensure everyone who needs technical assistance or has computers to recycle knows about the move. If you’re able, download one of our grand opening announcement fliers and share with your family, coworkers, and friends. We have both full and handout sized in color and black and white. Check them out! 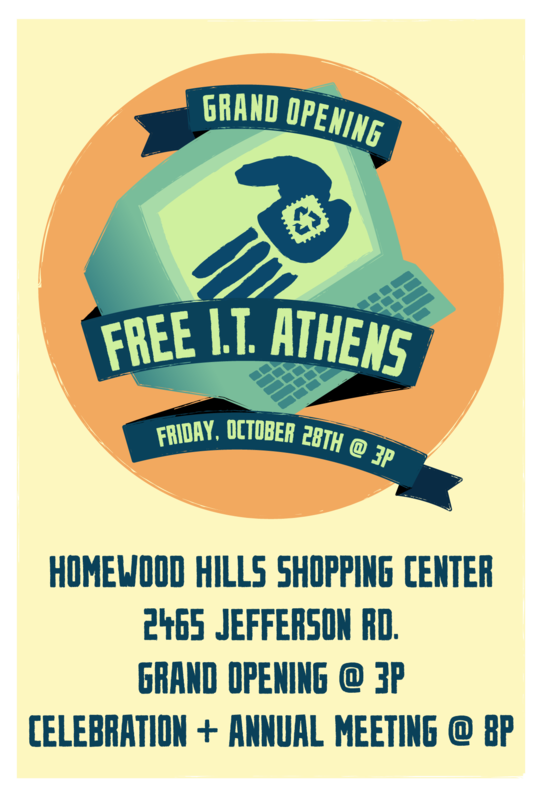 As always, if you have any question, please don’t hesitate to hit us up on Facebook or Twitter, or email us at contact@freeitathens.org. See you at Homewood Shopping Center! Previous PostImportant Moving UpdateNext PostFree I.T. is Relocated!